67S Joseph Rodgers Lambsfoot and Pen Stainless Steel KnifeThere have been cutlers in Sheffield since before the fifteenth century and the City is famous for its knives. When Sheffield is mentioned anywhere in the world the automatic reaction is still Steel and Cutlery.The Egginton Group will continue the fine traditions of craftsmanship which have been developed in the City and will continue to produce quality knives and Sharpening Steels which are regarded as worthy to carry the illustrious names of Group members and Sheffield. 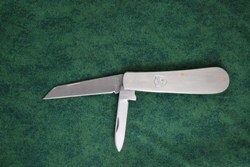 This knife with stainless steel handle features the Joseph Rodgers star & cross trade mark, first registered in 1682.